The TASCAM RC-HS20PD controls the HS-8 (and HS-2) solid-state recorders. It offers flash start with 20 dedicated, illuminated buttons and further control through a colour TFT touch screen interface - which can be used for the same operations as the display on the connected HS-8 (or HS-2). Five pages of instantaneous playback start (flash start) are available for a total of 100 tracks. A 100mm fader includes fader start for broadcast use, and a 0dB lock is available for the fader. Also included are a monitor speaker and headphone output. The RC-HC20PD connects to recorder with a supplied 5m CAT6 cable. TASCAM's HS-8 is an Industry Standard for professional multi-channel recording and playback using solid-state media. From studio surround recording to post production playback of HS-P82 location recordings, the HS-8 fits a variety of multi-channel roles. Also true to TASCAM tradition, audio is top-quality throughout with up to 192kHz/24-bit recording. Like Tascam's HS-P82 location multi-track, the HS-8 uses a colour touch-screen interface to access settings and tracks. 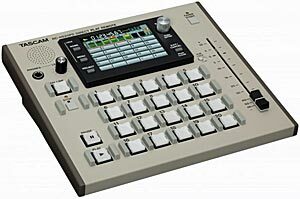 A mixer is built-in for monitoring, and the stereo mix can be recorded live as a separate track. Audio is recorded as Broadcast WAV files to Compact Flash media, with SMPTE timecode available on various interfaces. The optional RC-HS20PD remote control (left) enables the HS-8 to instantly start playback of up to 100 takes (flash-start) directly, or by using the fader start/stop option. The built-in TFT colour touch screen can be used for the same operations as the display on the connected HS-8. The RC-HS20PD is connected to the HS-8 with a CAT6 cable, enabling control of the HS-8 from up to 10m away (5m cable included with product). Also available: the Tascam HS-2 stereo solid-state recorder with timecode.